Today’s family expedition took us to Lake Alice Wildlife Management Area which is on the Lake Champlain Birding Trail. It’s nice to do something different every once in a while, and that would be today. 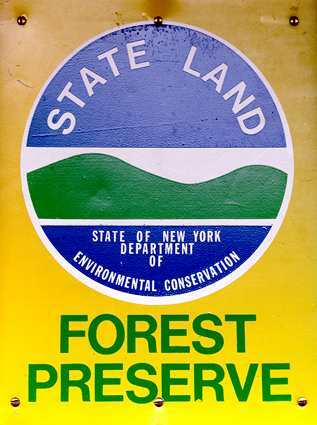 Located in the Town of Chazy, just off the Northway – Exit 41, the Lake Alice WMA is a great place for an easy nature walk. Spring is here, but it is still a bit early for things to really get blooming. It was sunny, breezy, and cool. We did get lucky with some interesting observations and entertained the kids at the same time. 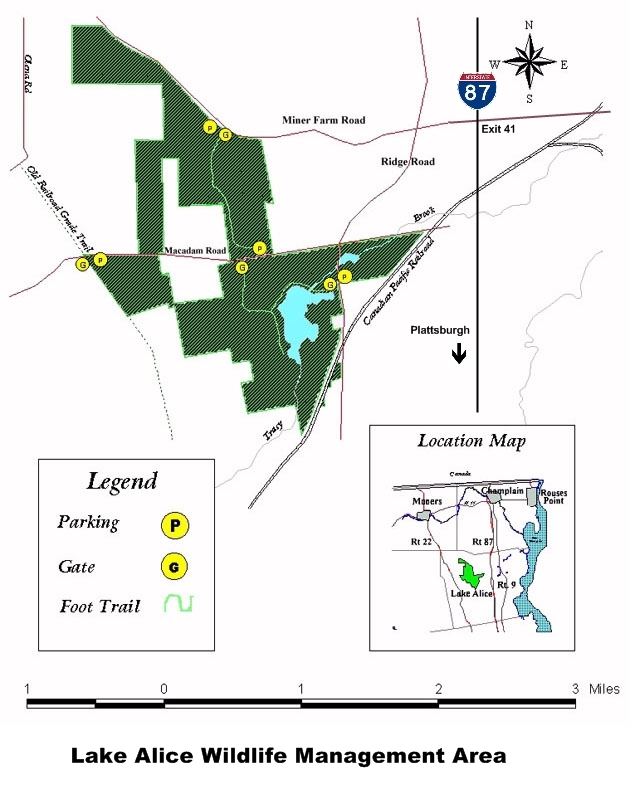 Totaling over 1400 acres, the ‘main’ area surrounds Lake Alice. This manmade body of water is the result of a series of dams orginally built for hydroelectric generation. Odd, considering the relatively small amount of water flowing through here. Everything was quite barren, nothing green, and mostly absent of any snow. We parked in the main lot and passed a couple of fishermen on their way out. Besides them, we had the place to ourselves. As we started out down the trail, the kids were making so much noise that I was not even expecting to see anything up close. We were immediately greeted by several Black-capped Chickadees, two of which landed right at the little one’s feet and had a brief tussle before chasing each other away. Quickly, a White-breasted Nuthatch landed on a nearby tree to investigate before disappearing into the trees. That was interesting, let’s keep moving guys. Lake Alice WMA is a critical habitat for many migratory birds, upland game birds, and songbirds. 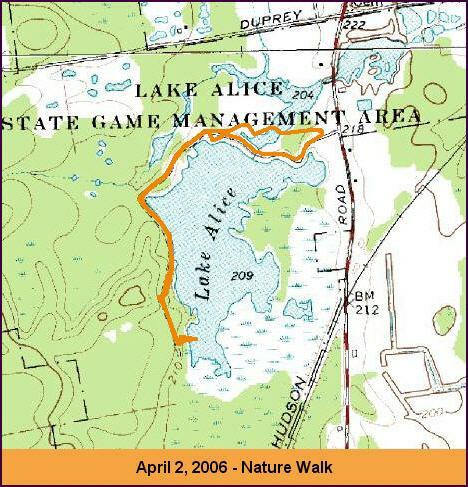 The 300 acres which includes Lake Alice and surrounding shoreline features a trail from the parking area that follows the shore to nearly the southern tip. Hunting in this area is off-limits, but we were not surprised to hear steady gunfire in the distance somewhere off to the west. Our first trip here with the kids was for the specific goal of geocaching. 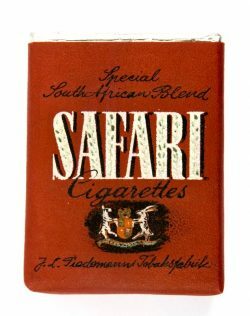 They couldn’t resist revisiting the cache and even had some goods to trade. Across the lake in the distance many Canada Geese could be seen congregating near the last piece of ice left. We scared a couple of sparrows, but besides that everything was quiet. As the trail veered south, the variety of habitat is apparent – mixed open fields and stands of hardwood surround the marshy edge of the lake. The whole area is pretty boggy and large stands of water could be seen in the still bare forest. As the trail split, we continued along the shore to the south. 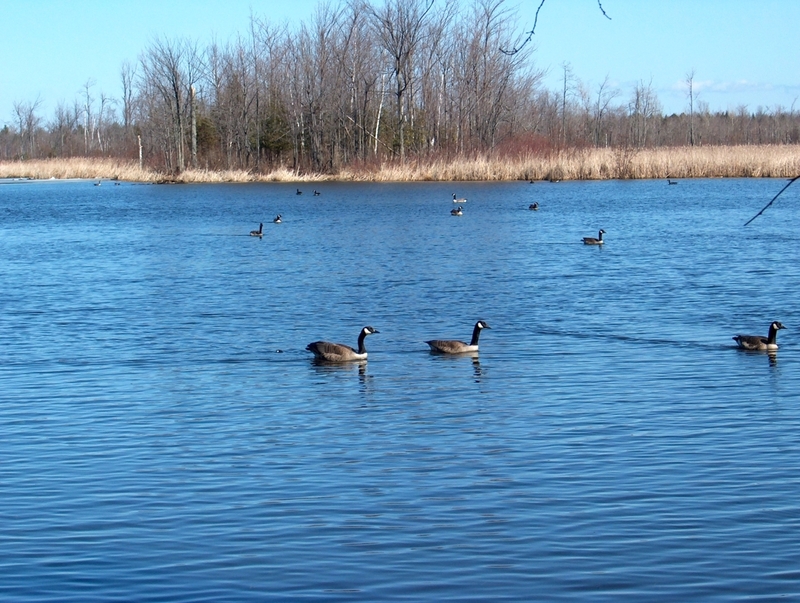 The numerous geese were quite visible and noisy! Several gulls circled overhead and settled on some rocks near the shore. 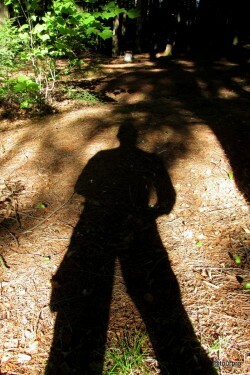 The trail entered the woods as we headed further south; this trail could really use some clearing. Not wanting to push our luck with the kids, we set a goal just ahead for a final look at the geese. A short whack through the brush brought us to a quite little corner near the souther tip of the lake. An old wooden hunting blind right on the edge of the shore provided ideal cover to view the many geese taking a rest on their migratory journey. It wasn’t long before the geese became accustomed to our presence and returned to their geese activities. Two Black Ducks flew overhead and landed on the far side of the lake. We enjoyed watching the geese for several minutes. 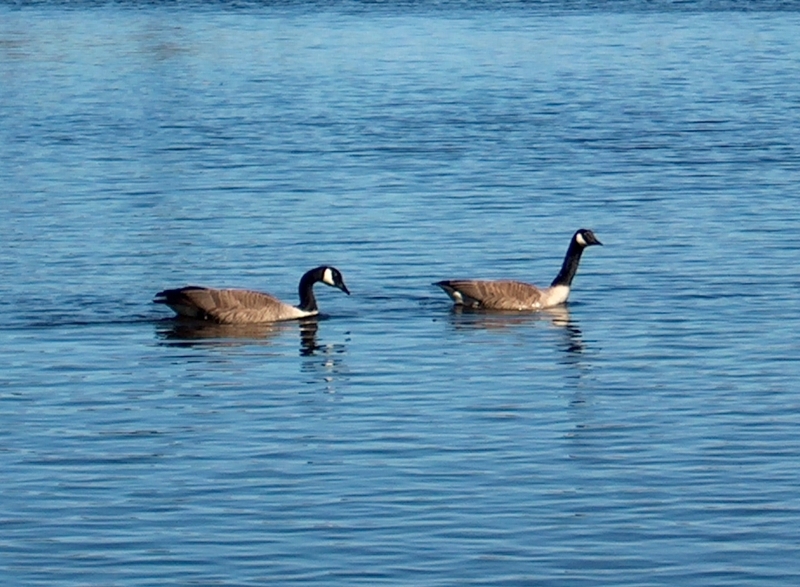 Something about watching these wild geese enjoying this great environment was very satisfying. As we returned back, we were passed by an older couple who asked us about the gunfire. I vaguely told them that it was far enough that they didn’t have to worry, but if it got any louder they should turn around. 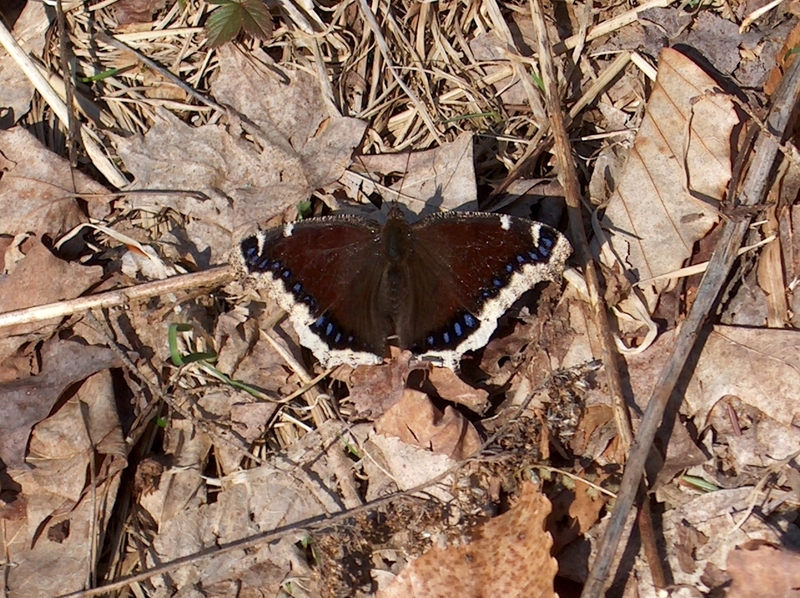 Got a nice pic of a Mourning Cloak butterfly. These guys apparently spend the winter in a state of ‘cryo-preservation’ and are one the earliest to appear. 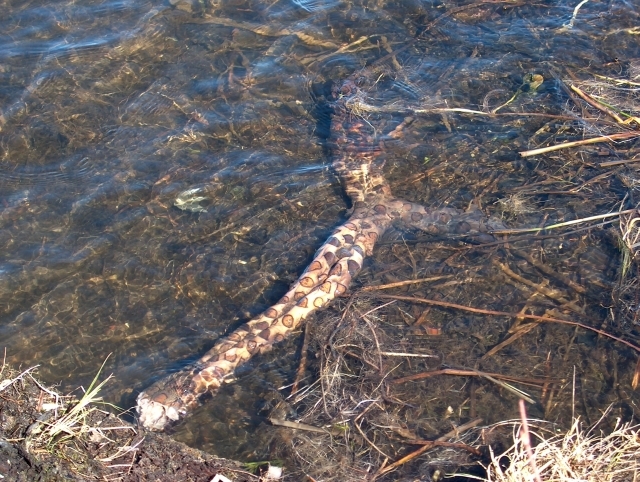 The boy spotted an odd ‘stick’ in the water which required further investigation. Wierd. We fished out a piece to investigate. I was really heavy and dense, but soft and squishy at the same time. Broke it open to check further and the inside is a pulpy/fibrous gooey orangish yellow. Never seen such a thing before. Some kind of water plant root? As we crossed a small footbridge, a pair of Mallards could be seen to the north. The kids were glad to see the car and looked forward to an ice cream reward. Update: The plant was identified as a Lily Pad Root/Stem. We thought it had to be some type of water plant due to its weight and ‘gushiness’. 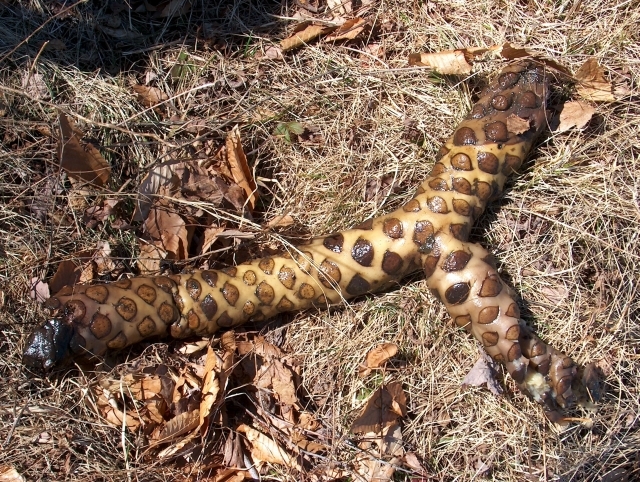 I thought it had to be something like that; the Chinese Lotus root (an edible delicacy) is very similar in appearance.